...... Two analogous sets of classes are provided for real and complex matrices, vectors and factorizations. While exposing an easy to use and powerful interface, the Bluebit .NET Matrix Library does not sacrifice any performance. Highly optimized BLAS and the standard LAPACK routines are used within the library and provide fast execution and accurate calculations. The Bluebit .NET Matrix Library has been developed as a mixed mode C++ project, combining together managed and unmanaged code and delivering the best of both worlds; the speed of native C++ code and the feature-rich and easy to use environment of the .NET Framework. Version 5.0 adds support for sparse matrices. 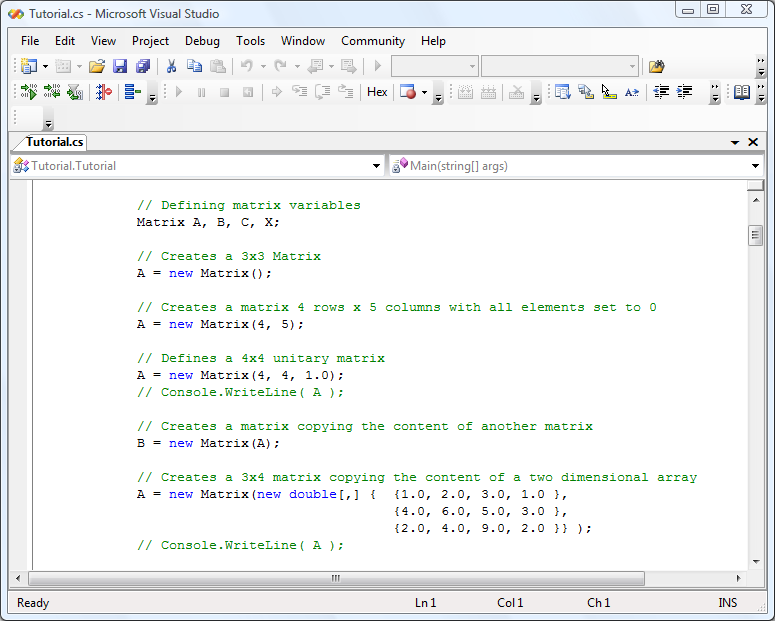 Qweas is providing links to .NET Matrix Library 6.0 as a courtesy, and makes no representations regarding .NET Matrix Library or any other applications or any information related thereto. Any questions, complaints or claims regarding this application .NET Matrix Library 6.0 must be directed to the appropriate software vendor. You may click the publisher link of .NET Matrix Library on the top of this page to get more details about the vendor.